Well written, entertaining, and original. It took me a little while to get into it, but it picked up quickly. Brandon Mull is very good at keeping his stories clean and appropriate for the whole family. When a new candy store opens in town, Nate, Summer, Trevor and Pigeon quickly learn that taking candy f rom strangers isn't the best idea. 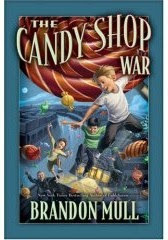 The owner of the store Belinda White makes magical candy which Nate and his friends must use to carry out Belinda's not so legal schemes. After being pushed too far, Nate and his friends decide to betray Belinda and help another local Magician, Mr. Stott. Mr. Stott does not seem as evil as Belinda White, but are his intentions pure? Nate and his friends must decide who to trust and how far they are willing to go to undo the damage they have done. Let me be the first to comment on your blog. I have not read the book yet but I thought it looks fun. If you approve it I will put it on hold at the library. Excellent grammar by the way. p.s. Hanny is Shannon.